Maggie Benoit, a senior at Plano High School, won 1st place at the 2014 Regional Oratorical competition in January at Leon Burson Post 395 Plano. Maggie placed second in the annual State of Illinois competition at Peoria Civic Center in Feburary. 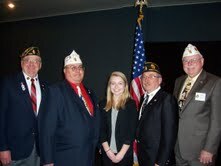 Maggie is pictured in the center above with left to right, Jim Hill Chairman of Americanism for Leon Burson Post 395 Plano, David Hicks Commander State of Illinois Legion, Maggie, Gene Schaefer 12th District Americanism Chairman, Wayne Wagner Senior Vice Commander State of Illinois Legion. The purpose of The American Legion’s National High School Oratorical Contest is to develop a deeper knowledge and appreciation of the Constitution of the United States on the part of high school students. Other objectives of the contest include the development of leadership qualities, the ability to think and speak clearly and intelligently, and the preparation for acceptance of the duties and responsibilities, the rights and privileges of American citizenship.